In contrast to conventional digital computers that operate as instructed by programmers, biological organisms solve problems and make decisions through intrinsic spatiotemporal dynamics in which their dynamic components process environmental information in a self-organized manner. Previously, we formulated two mathematical models of spatiotemporal dynamics by which the single-celled amoeba (a plasmodial slime mold), which exhibits complex spatiotemporal oscillatory dynamics and sophisticated computing capabilities, could solve a problem and make a decision by changing its amorphous shape in dynamic and uncertain environments. These models can also be implemented by various physical systems that exhibit suitable spatiotemporal dynamics resembling the amoeba’s shape-changing capability. Here we demonstrate that the photoexcitation transfer phenomena in certain quantum nanostructures mediated by optical near-field interactions mimic the amoeba-like spatiotemporal dynamics and can be used to solve two highly complex problems; the satisfiability problem, which is one of the most difficult combinatorial optimization problems, to determine whether a given logical proposition is self-consistent, and the multi-armed bandit problem, which is a decision-making problem in finding the most profitable option from among a number of options that provide rewards with different unknown probabilities. Our problem-solving and decision-making models exhibited better performances than conventionally known best algorithms. 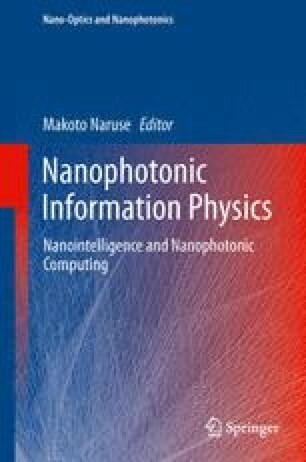 These demonstrations pave the way for a novel nanophotonic computing paradigm in which both coherent and dissipative processes are exploited for performing powerful solution searching and efficient decision-making with low energy consumption.